Xiaomi has launched new smartphones in his budget segment naming Redmi Y1 and Redmi Y1 Lite. Both phones are well received by the customers and have great specifications to compete with other phones in the same price segment. Xiaomi has now released stock firmware of Redmi Y1 and Y1 Lite with 9.1.2.0 Global Stable Version. In this article, we have provided the download link for Redmi Y1 stock firmware, Redmi Y1 Lite Stock firmware. Also, we are going to see the step by step procedure on how to flash stock ROM on Redmi Y1 and Redmi Y1 Lite. Redmi Y1 is powered by Android Nougat 7.12, SD 435 chipset and 3GB of RAM. Display size is 5.5 inch with 1280x720p screen resolution. It comes with 3080mAh battery and has 32GB of internal storage. 13MP rear camera and the 16MP front camera is USP of this device. Redmi Y1 is sold at Rs. 8999/- in India. Redmi Y1 is powered by Android Nougat 7.1.2 OS, SD 425 chipset and 2GB of RAM. Display size is 5.5 inch with 1280x720p screen resolution. It comes with 3080mAh battery and has 16GB of internal storage. 13MP rear camera and the 5MP front camera. Redmi Y1 is sold at Rs. 6999/- in India. Flash stock firmware on Redmi Y1/Y1 lite to eliminated issues like the low response, hang problem, automatic reboot. Flash Stock Rom on Redmi Y1/Y1 Lite to fix problems caused by root access by flashing stock firmware. flashing stock ROM on Redmi Y1/Y1 Lite will help you to get restore your warranty back. Flash stock firmware to clean root access. This firmware is only for Redmi Y1/Y1 Lite. Backup all your internal storage data as flashing process format internal storage. you must have adb drivers installed on your computer before flashing stock firmware. please follow all steps carefully, unable to do so may hard brick your device. Step3: Turn off your phone and open it in Fastboot mode by pressing power button + Volume Up button simultaneously for 5 seconds. From Fastboot menu click on download button. Step5: Open Mi flash tool and Click on the select button. 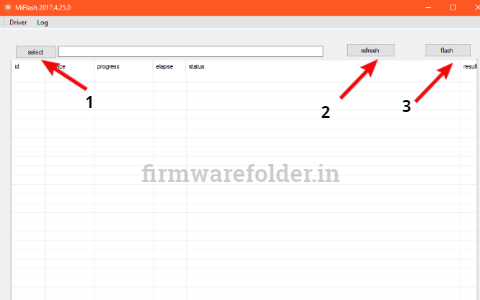 Choose the firmware folder you extracted in step2. Step7: Once the device gets detected, click on Flash button on Mi flash tool and wait for flashing process to complete. Step8: After flashing completed, remove the device and turn ON, do initial setup and your device will be updated to the latest stock firmware. By above eight steps you can easily flash your Xiaomi Redmi Y1 / Y1 Lite. 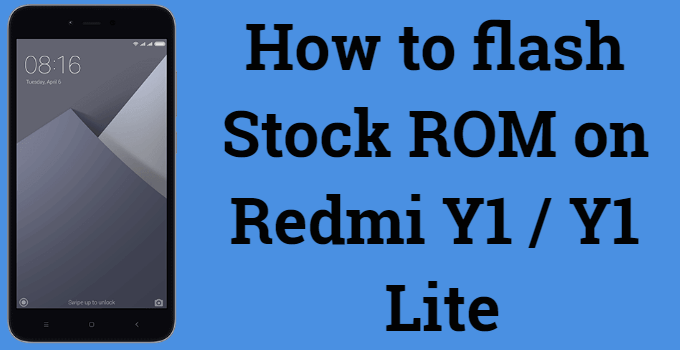 I hope this guides helped you in flash stock ROM on Xiaomi Redmi Y1 / Y1 Lite. You can always comment your questions and suggestions if any in below section.